1. 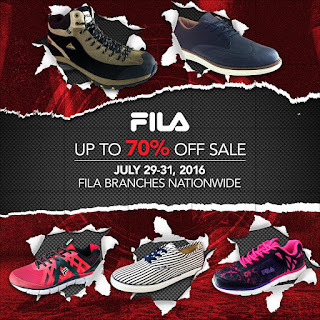 FILA 3-day Nationwide SALE: July 2016 - Get up to 70% off on all FILA shoes this weekend! Visit your nearest FILA branch on July 29-31, 2016 and avail of big discounts! 2. Great Kids & Pois Belly 3-day SALE: July 2016 - Great Kids and Pois Belly & Kids 3-day SALE happens until July 31, 2016. Enjoy 10% OFF on ALL regular-priced items, and up to 50% OFF on great selections. 3. Metro Stores National Lipstick Day SALE: July 2016 - It's The Metro Stores National Lipstick Day SALE! Score discounts and get the best deals from your favorite lippies brands in all Metro Department Stores and Super Metro Stores nationwide. 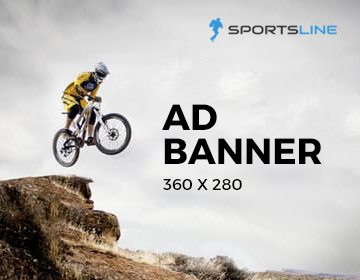 Hurry promo happens until July 31, 2016 only! 4. Robinsons Department Store National Lipstick Day SALE: July 29, 2016 - Robinsons Department Store is joining the International Lipstick Day today, July 29, 2016! Head over to Robinsons Department Store near you to score great discounts on selected lipstick brands. 5. Pacsports Golf Madness at Tiendesitas: July 2016 - Check out Pacsports Golf Madness on July 29-31, 2016 from 11am to 9pm at The Events Area 1, Tiendesitas, Pasig City. Get up to 80% off on your favorite golf gear brands! 6. The North Face End of Season SALE: July-Aug 2016 July 29 - Yes, we never stop shopping, especially now that The North Face is having its End of Season SALE! The North Face End of Season SALE happens from July 29 to August 15, 2016 in all The North Face, and R.O.X. stores nationwide, and The Travel Club TriNoma. Don't miss it! 7. World Food Expo August 3 to 6 2016 - World Food Expo 2016 is happening on August 3, 2016 to August 6, 2016. 8. The Big Beauty (Skincare & Fragrances) SALE - Check out The Big Beauty SALE at Rockwell Center, Makati. Enjoy up to 70% off on your favorite skincare and fragrance brands like H2O+, Alyssa Ashley, Bvlgari, Lacoste, United Colors of Benetton, Lanvin, Banana Republic, Clinique, Issey Miyake, Nenuco, Perry Ellis, Victoria Secret, Nike, Addidas, Anna Sui, Nenuco, Davidoff, Salvatore Ferragamo, Burberry, Calvin Klein and many more!